Dr. William Thomas Brand was born in Staunton, Va., and grew up in Roanoke, Va. He received his B.A. from the University of Virginia in 1976 and his M.D. at the Medical College of Virginia in 1980. Dr. Brand excelled academically, achieving membership in Phi Beta Kappa honor society and receiving the Robert C. Ryan Pathology Award in 1977. 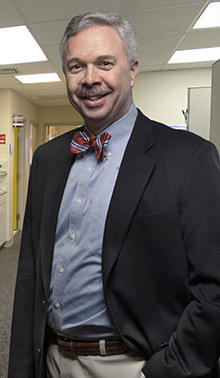 He completed his Gastroenterology Fellowship at Walter Reed Army Medical Center from 1984-1986; this was followed by a year as Director of Gastrointestinal Endoscopy and a year as the Director of Gastroenterology Service at Eisenhower Army Medical Center. In recognition of his achievements while serving in the military, Dr. Brand was awarded an Army Commendation Medal and the Meritorious Service Medal. He has served as the Chief of Staff at Henrico Doctors’ Hospital, and he currently serves as the Chairman of the Endoscopy Committee. GSI welcomed him into our practice in 1988, and since then he has been named one of the area’s “Top Docs” so often we have lost count. Dr. Brand’s interests include music, travel, UVA sports, and Virginia history. His wife, Lisa, has been active with The Richmond Academy of Medicine Alliance and with the Council of the Virginia Museum of Fine Arts. Request an Appointment with Dr. William Thomas Brand Jr. Appointment Request for Dr. William Thomas Brand Jr.